The 5505VX.. Ball Nose Cutters have a reinforced design feature, which delivers a high volume of chip removal. 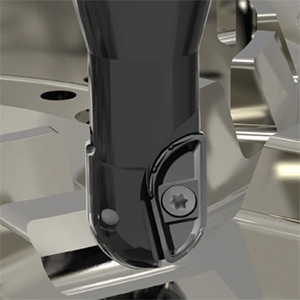 The chip breaker geometry provides excellent chip control and evacuation during machining and prevents edge build-up. 5505VX Roughing Ball Nose Cutter are ideal for roughing and semi-finishing prifiles and complex contours. One grade and one geometry are qualified to machine Steel Alloyed Steel, Stainless Steel, High Temperature Alloys and Cast Iron.